We got a report this week that the hole in the ozone, which has always been centered over Antarctica, is the largest it has ever been. This year it has opened to cover the entire continent. Of course there are many scientists down here studying the ozone hole. 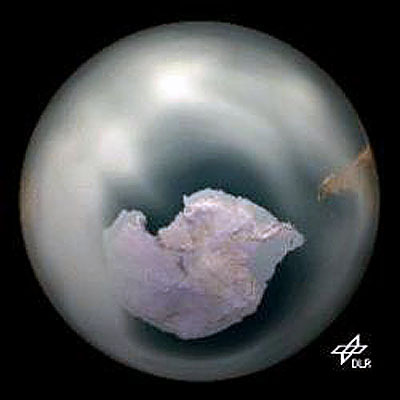 Without the ozone layer to stop the ultraviolet radiation, life as we know it cannot exist. The chlorine released from CFC's in refrigerators, air conditioners, aerosol sprays, plastic foams, etc., are very stable compounds and can remain in the atmosphere for a hundred years or more. 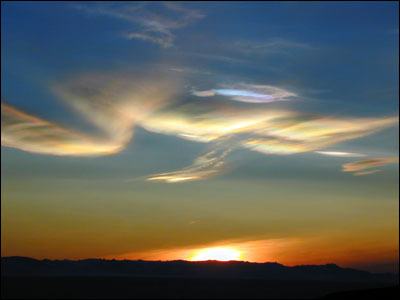 They are only broken down when they get above the ozone layer and are exposed to ultraviolet radiation, at which time they release chlorine atoms which destroy ozone. 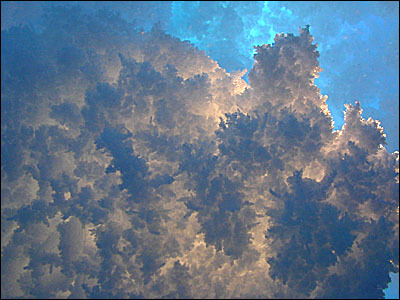 One chlorine atom can destroy as many as 100,000 ozone molecules. 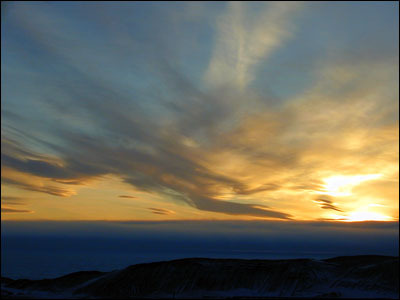 When the sun returns to Antarctica after the dark polar winter, the CFC's begin to break down and the ozone hole opens up. According to some of the figures I read, there has been a 10% rise in skin cancer in humans, and a 2% increase in deaths from it. It can also cause cataracts in the eyes of humans and animals. What it means for us is that we have to be very careful to wear heavy–duty sunscreen and wear sunglasses whenever we are outside in the sunlight. It is barely more than a month now before the sun will stay up 24 hours a day. And with temperatures going up as well we will be wearing fewer and fewer coverings. As it is now, I only cover my face if I am going to be outside for a long time, and even then I don't do it continuously. I must be acclimating because I am not wearing nearly as many layers of clothing as I did when I first arrived. Only if the wind is kicking up do I still feel the need. 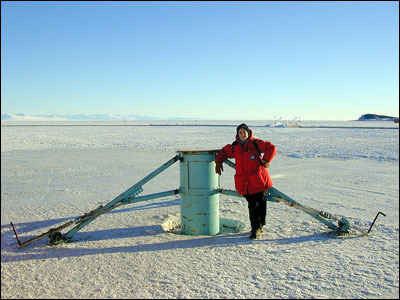 Not far from town, just off shore on the sea ice, they installed an observation tube which goes down under the ice. 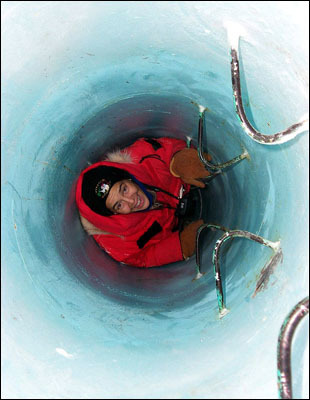 I got to go in one last season which was very far out on the sea ice where the water was very deep. 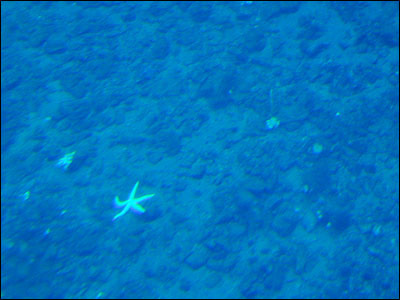 The one that is set up this season goes down to about 15 feet above the ocean floor so there are things to see. Because this ob tube is just a short hike from town, we can check out the key from the firehouse and go out there. 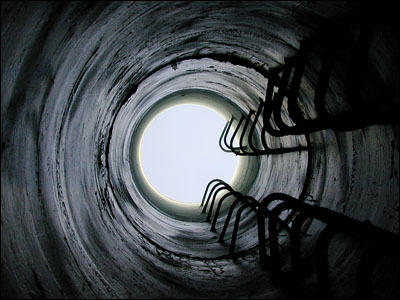 The tube goes 30 feet down and there is a small observation bell at the bottom. The tube is rather narrow, and as you climb down your back slides against one wall and with each step you take your knees touch the opposite wall. There is a bit more room in the observation bell, but not much — just enough room to turn around in. 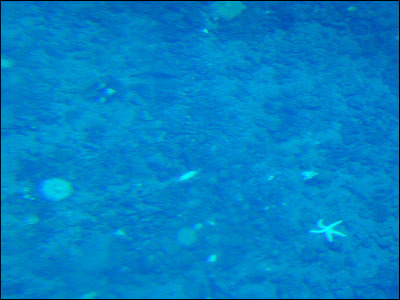 There were sea urchins, sea spiders, and starfishes. We also saw several small jellyfish. Some people have said they have seen large jelly fish at least a foot tall. With the water here being so shallow, the colors in the ice were not as vibrant as last year when I went in the observation tube that was over deep water. Still, it was pretty nice. It is also beautiful to see the ice crystals forming on the outside of the windows. The divers have to go down and break them off from time to time. There is only room for one person so anyone that is claustrophobic really has a problem. Once you have reached the bottom, someone on the surface puts a board over the top of the ob tube so that it cuts out the excess light. It feels as though you are being sealed in. You sit down there by yourself and, for me, it is a very calming feeling to sit there under the ice and watch the sea creatures. The sound travels so far through the ice and water. You can hear every step anyone takes on the ice above you, and you can hear the seals calling to one another, but I didn't get to see any. It is a very special place and I plan to make several more trips before it gets removed. 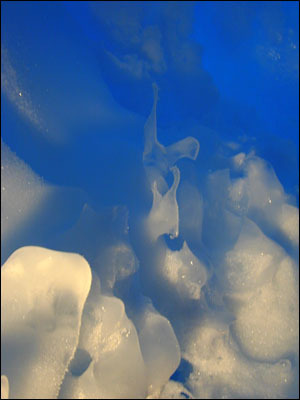 I would like to tell you about some different types of ice structures. An Ice Shelf is a very large and flat–topped sheet of ice which floats on an ocean or lake and is attached to the edge of the continent. The largest is the Ross Ice Shelf which is about the size of Texas. 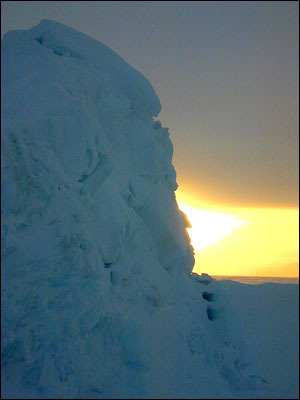 McMurdo Station and Ross Island are just at the edge of the Ross Ice Shelf. 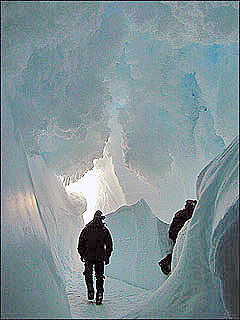 Ice shelves are formed and added to by the flow of ice from the land, and from new snow. 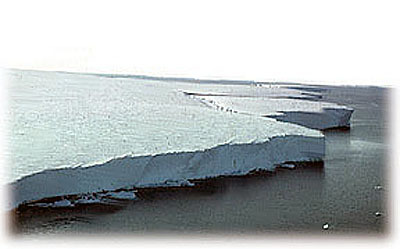 The ice shelf never melts in the summer and is what we call the permanent ice. It is where some of our runways and launch sites are built. At the outer edges huge chunks of ice calve off and fall into the sea forming icebergs. About 6 months ago an iceberg about the size of Jamaica broke off from the Ross Ice Shelf and is floating in our direction. 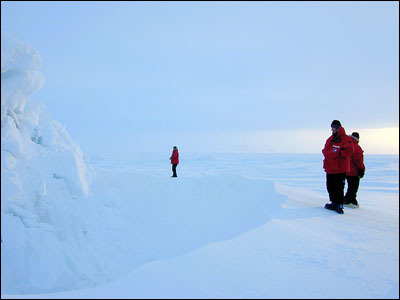 These ice shelves can be very high — sometimes 200 to 400 feet above sea level. 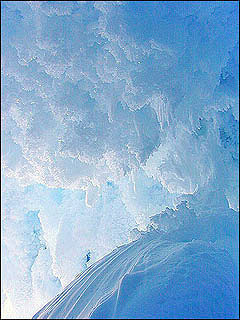 Glaciers are large masses made up of ice, air, water and rock debris. They are formed at least partially on land and move from gravity through the rocks and mountains, moving much faster than the surrounding ice. 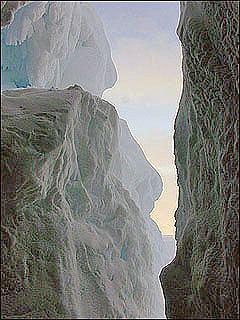 Most glaciers, except for those trapped in the dry valleys, end at the sea where they also calve off, forming icebergs. 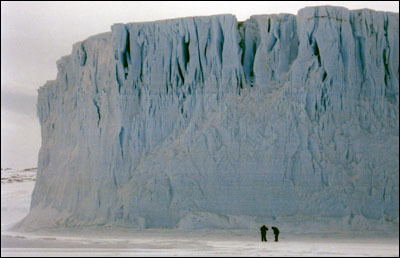 The Barne Glacier, which I got to visit last season, stands about 100 to 200 feet high. We were not allowed to go too close to the glacier as the edges are very unstable. 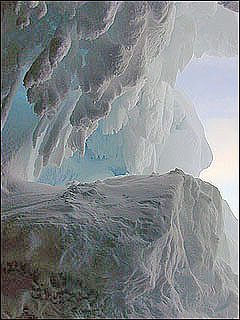 An Ice Tongue is a long and narrow sheet of ice projecting out from the coastline. It forms when a valley glacier moves very rapidly out into the sea or a lake. 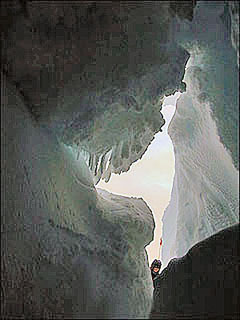 The Erebus glacier comes down from Mt. Erebus and protrudes off the coast of Ross Island forming an ice tongue out into McMurdo Sound. It extends about 3–4 miles out into the sound. When the sea thaws in the summer, the ice tongue floats on the water without thawing. 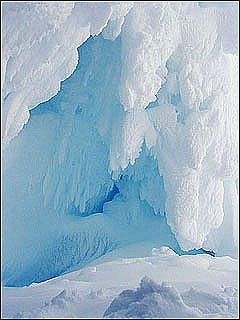 It also calves off in places forming icebergs. 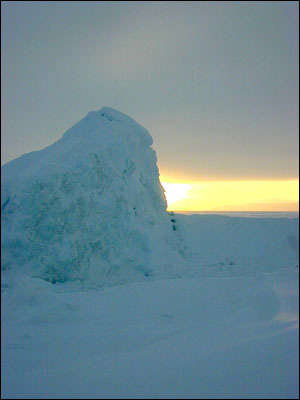 The Erebus Ice Tongue is only about 30 feet high so its icebergs are considerably smaller. When the ice around the tongue melts in the summer the waves of sea water constantly batter the edges of the tongue, carving very elaborate structures in the ice. Sometimes these pieces will calve off and sometimes the waves will cut very deep caves into the edges of the tongue. In the winter the sea water freezes once more around these new shapes. 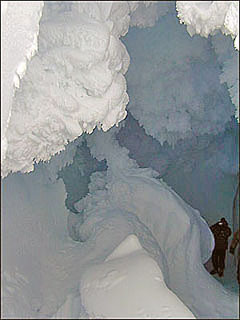 This season the search and rescue team discovered two nicely formed ice caves along the southern edge of the Erebus ice tongue. On Sunday I got the opportunity to go out and visit the caves. One cave is a fairly good size which could take at least 20 people at one time. 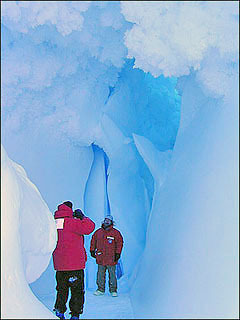 Several areas of the cave are large and very smooth. These were carved by the water. 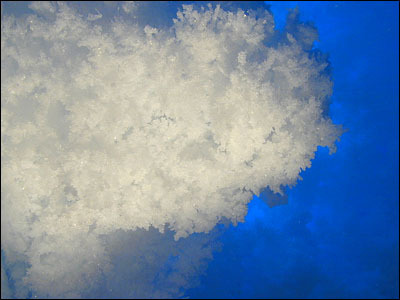 In other places ice crystals have formed one on top of another until they create huge and beautiful formations. If you bump into them and break them off, which is impossible not to do as they are almost everywhere, it sounds like you are breaking the most delicate crystal. 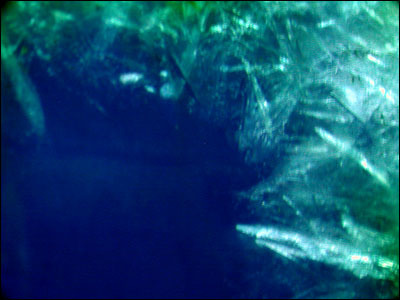 The colors inside the ice are such an intense shade of blue and in some cases almost a deep violet. If you stay inside until everyone leaves it is almost totally quiet. Everything really shimmers. The second cave is much smaller and has several small rooms. Only two or three people can go in at a time. 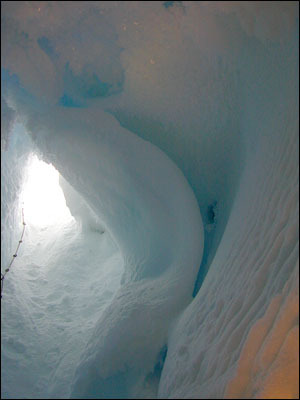 This cave goes down into the ice tongue. You get yourself situated at the entrance and then slide down like a giant sliding board. 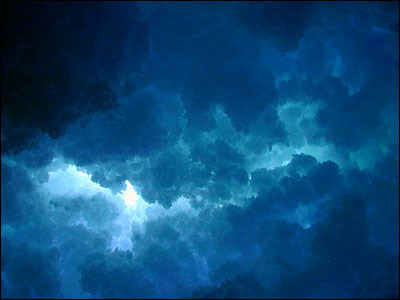 When you get to the bottom of this cave is where the blue becomes the most violet. 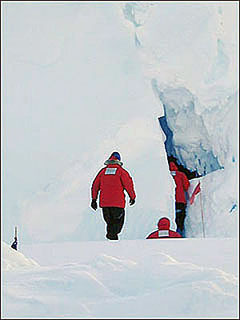 The search and rescue team marked a couple of the rooms off limits as they go very deeply down into the ice. 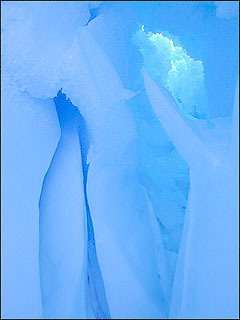 The shapes of the ice in this cave were different from the shapes of the big cave. To get out of the cave they tied a rope so that we could pull ourselves up. It probably would not have been too difficult if we weren't so encumbered with ECW gear and huge boots, not to mention cameras and the like. It was probably cold in the caves, but I was so excited and awed to be there that I did not notice and don't remember. In the fall when the sound begins to freeze up again, any icebergs that are floating become trapped in the ice. Last year there was a beautiful iceberg which was calving and had a huge crack down one edge of it. The only iceberg they have found this year is not nearly as impressive. It looks more like a pile of snow which has been bulldozed. We stopped to have a look at it on the trip to the ice caves. 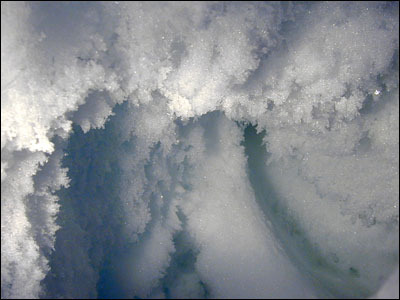 The interesting part was how the pressure ridges and ice cracks have formed around it. The sun was also at a good level in the sky so it helped create some interesting effects. The temperatures have not been too bad this week. The highs have been around –11°F and the lows averaging about –35°F. 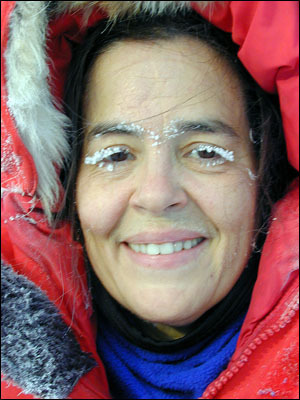 The winds have been mostly calm so the wind–chill has not been too bad. I think the worst was around –67°F this week. 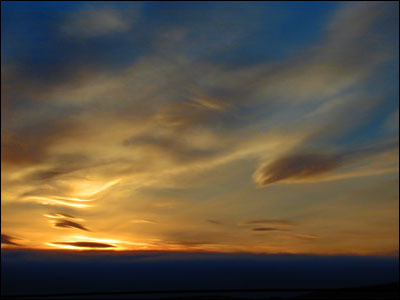 The sunrises and sunsets average about 7 minutes earlier and later, respectively, each day. That means that we gain almost two hours of sunlight in a weeks time. It is amazing to see the differences. The incredible sunsets continue to amaze us. 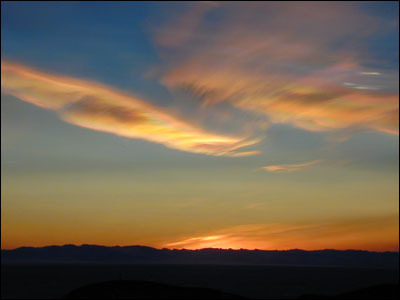 Colors, cloud formations, and everything about them are lovely. Forget what I just said in the last paragraph about the temperatures not being so bad. Friday night I awoke around 1:30 A.M. to what sounded like a 747 landing just outside my window. I looked outside to what looked and sounded like hurricane force winds. Snow was blowing everywhere. The heat was on in my room, but with the temperature dropping so fast outside, you couldn't tell it. I turned on the television to the channel which gives us our local information to find that we were in the middle of a Condition 1 storm. We classify weather conditions into three categories with 1 being the worst and 3 being the best. I saw plenty of condition 2 storms last season, but only the fringes of a condition 1. I woke up several more times during the night and got up to get another blanket at one point. When I finally got up in the morning my bed, which sits near the window, was entirely covered with snow. It had blown in through the cracks in the window. The temperature in my bedroom was just under 60°F. I checked the television again and the wind–chill outside was registering at –106°F. For most people, a condition 1 storm means that you stay in whatever building you are in until the search and rescue team can tie ropes between the buildings to guide you from one place to another. However, when the weather gets that bad, things start breaking down. Heating systems begin to fail, the heat trace which keeps the pipes from freezing breaks down, the pipes freeze and burst, etc. If these things are not tended to immediately, buildings freeze, people have no heat, and it can prove fatal. That means those of us in the trades have to venture out regardless of the conditions. I dressed as quickly as I could and headed up the hill to the shop. Walking against that wind was very difficult, and a couple of times when a gust would blow between the buildings, it would knock you down. If the street was icy, it would push you along for several feet as if you were on skates. It was quite an amazing experience. Fortunately I worked inside for a good bit of the day, but there were some grueling stretches having to work outside. By mid afternoon, the wind was gone and temperatures were going up. They always tell us that the weather here can change at a moment's notice. Now I know what they mean. Some of the kitchen staff took a huge pot of boiling water to the back dock, threw it in the air and it was frozen before it hit the ground. Amazing. 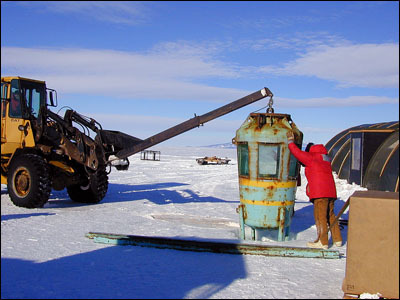 Also a couple of the guys working on the planes out on the sea ice had 5 large steel wrenches shatter in their hands.